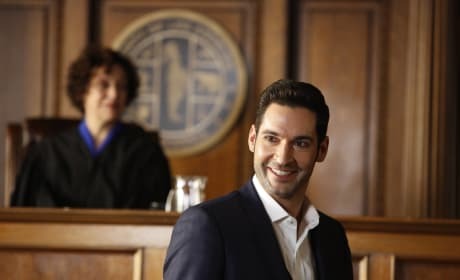 It didn't take long for Lucifer to take over the courtroom. Is that really any surprise? We bet Charlotte isn't too happy about that. 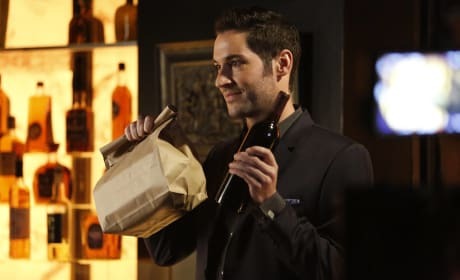 Even if Lucifer is trying to be serious, it certainly doesn't look like he's being serious, does he? We wonder if he's trying to find out what the bailiff secretly desires. 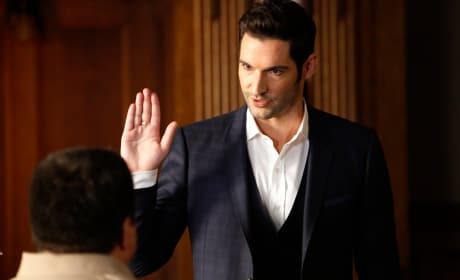 We bet Lucifer thinks the whole courtroom experience is just fun and games. What could he possibly be testifying about? 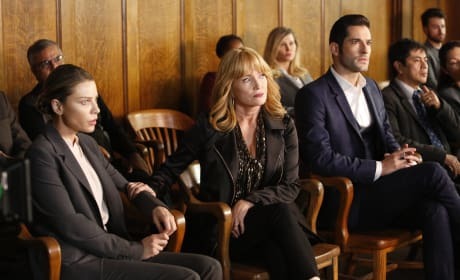 We can't wait to see what Lucifer is going to do in the courtroom. Will he cast his spell on the jurors,, or just woo them with his incredible charm? There's a bit of evil behind that slight smile on Charlotte's face. 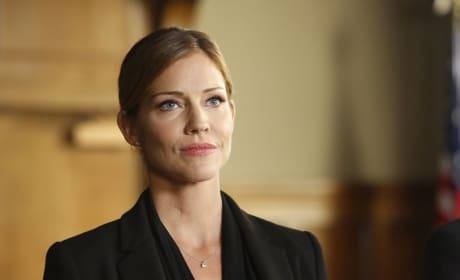 Will she finally convince Lucifer to leave L.A.? It looks like Charlotte may be taking the lead on whatever case is at hand here. She seems to be taking her human self pretty seriously even though she wants to get back to the "Silver City" as soon as she can. Will she ever be able to get there? It looks like someone may be in a bit of trouble. 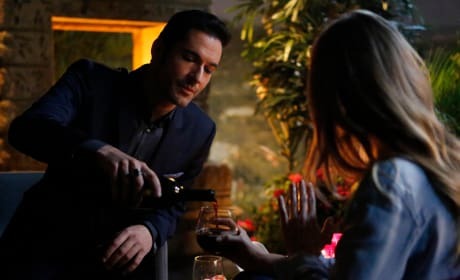 If Charlotte is involved that probably means it's Lucifer. But, then again, Charlotte does have her sights set on Chloe, doesn't she? Trixie looks so cute with her mama in this picture, doesn't she? And we're absolutely loving Chloe's sweater! 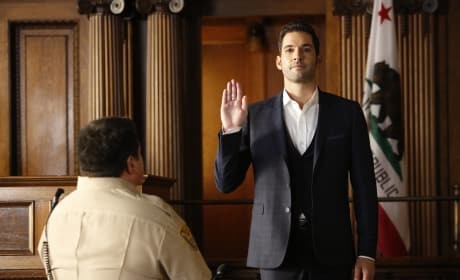 Will Lucifer ever find out about Dan and Charlotte? Will Maze tell him? Remembering what happened between Dan and Charlotte still makes us gag a little. Chloe's mom is back, but why? 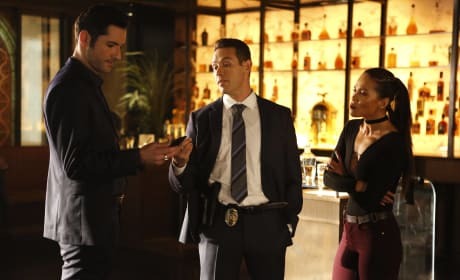 She doesn't look too thrilled to see Lucifer. Or is she just surprised to see him there? 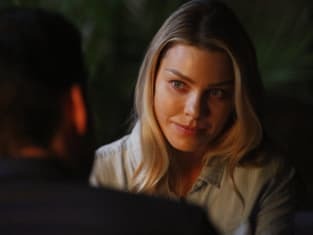 Is this before or after Chloe and Lucifer's romantic rendezvous? What could be in the bag? Is it a special surprise for Chloe, or just a couple of sandwiches for dinner? Even though we'd rather wait for a Clucifer union, our hearts can't help but explode at these two sharing a quiet romantic-type moment together.